Well, it’s been a day. One you probably won’t see 500 words about, but I didn’t say I was going to publish 500, just write them, so journaling counts and the night is young yet. I spent most of today doing laundry. Those girls had a lot of clothes in the floor of their room. I calculate that I’ve done roughly 60 bucks worth of washing and drying over this weekend. Now that included my stuff, which was substantial in its own right as I have managed to avoid doing it for a couple of months. It wasn’t on the floor, mind you, but it was stacked pretty high in the basket. I also did a good bit of reading in Barron’s Complete Guide to Materials and Techniques for Drawing and Painting. Apparently, I will do anything about art except actually make it. Bleh. But I also learned a good bit. I’m trying to get the rest of these library books read and turned back in before they are overdue. I accepted delivery of six more pairs of Muk Luk socks. These socks are so very warm. They kept my toes and calves toasty while I walked around New York right after Christmas, and I am sure I will get equally good use out of them here at home. It’s not even supposed to get above freezing for the next few days. I also like them because they are thin, and in a skirt they look like patterned tights. I’m not sure how they got all that goodness in there, but I’ll take it. Also, I am amused by the fact that I now live in a place where my clothing, including socks, must be seasonal. Amused and glad. I have too many beautiful sweaters that rarely saw the light of day in North Carolina, where wool season lasts precisely 28.75 days. Then I had a debate about the practice of locking churches and how this may or may not violate the intent of same as recorded in the Bible. That debate has been deleted after an ad hominem attack which was not initiated by me. I tell you what: I may split hell wide open one day, but it won’t be because I refused to apply the principles of right living as defined by Christ to my life. So there’s that. 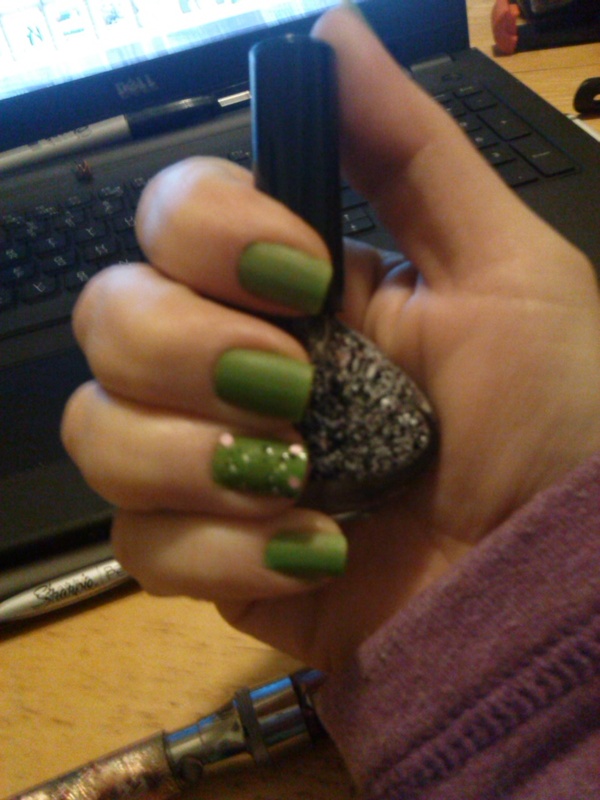 Then I painted my nails this lovely green with black, white, and pink dots for the accent nails, and mattified the rest. I love that mattifier. It’s so unexpected, particularly with a popping accent nail. Tomorrow is back to work for me. I’ve enjoyed my time at home (and away), but I’ve missed client contact, as well. It will likely take me most of the rest of the evening to get myself ready for the week–laying out my clothes, gathering the art supplies I will take with me, and packing my work bag. I looked at my TimeHop app today, but I didn’t post anything from it. Here’s the thing: when you have loved someone intensely there are reminders around every mental corner. There was one yesterday, too. I think…no, I know that I am glad of that. I smile even as my heart squeezes. I understand how the thornbird feels as it sings. Oh, look. I hit the 500 after all. This entry was posted on January 5, 2015, in cass talks about herself. Bookmark the permalink.